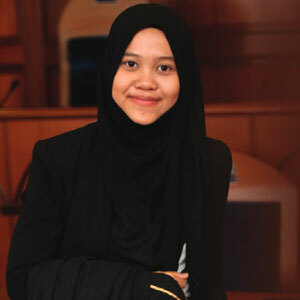 Bachelor of Law and Shariah with Honours - (LLB and Shariah) (Hons.) is designed to equipped students with knowledge and skills in aspects related to both Syariah and Civil Law. The curriculum is designed to produce professionally competent and qualified legal personnel, in Syariah and civil, who are committed to the practice and promotion of Islamic principles and teachings in the legal profession. Students who are successfully completed this programme are expected to be able to practice in both Syariah and Civil Law area. Students are required to complete 159 credit hours, comprised university required courses, faculty required courses, programme required courses and electives courses. Legal Officer; Magistrate, Senior Assistant Registrar of the High Court, Deputy Prosecutor, Federal Counsel, Research Officer, Assistant Director of the Legal Aid Bureau, State Legal Assistant Adviser, Federal Counsel at Public Organizations. (4) Mendapat sekurang-kurangnya Tahap 3 (Band 3) dalam Malaysian University English Test (MUET) dan Gred 2A/A- dalam mata pelajaran Bahasa Inggeris di peringkat SPM. Mendapat sekurang-kurangnya Tahap 3 (Band 3) dalam Malaysian University English Test (MUET) dan Gred 2A/A- dalam mata pelajaran Bahasa Inggeris di peringkat SPM. Additional requirement for QL04: Must obtain at least BAND 4 (MUET) / BAND 6 (IELTS) / 600 (PBT) or 250 (CBT) or 100 (IBT) in TOEFL. My experience studying law in FSU has been an exhilarating roller-coaster ride. Outside classroom activities and learning like my participation in moot court has helped me engaged further with the real-world. It has enabled me to interact and network with other law students and as a preparation to join legal industry. It is definitely a cherished chapter in my book of life.